My friends often ask me for recommendations for lawn mowers. But I keep telling them that every user’s needs and lawn structure are different. So, they’ll require something suited to their needs as no single machine out there can do all. However, there are some mowers which are versatile enough to fit a wide range of uses and customer needs. And among them, the Ferris IS700Z is simply one of the best! It was only recently that I got a hold of this mower and took it for a spin around my lawn. And I must say that in terms of performance and comfort, the mower was truly phenomenal. And I‘m confident that its versatile list of features will be able to fit your grass trimming needs quite perfectly. Ferris Lawn Mower Reviews 2019: Why do I love IS700Z so much? Where does the Ferris IS700Z Riding Mower fail to impress? This Ferris lawn mower is all about turning a slow, bumpy mowing into a very comfortable grass trimming experience. It comes with patented suspension technology that along with improving the riding comfort enhances the overall productivity and efficiency as well. I find trimming accuracy and precision to be another aspect in which the Ferris is absolutely amazing at, and it’s all thanks to the ICD engineering that the mower deck is designed with. The mower is extremely easy to use as well and comes with features that will fit both professionals and domestic users alike perfectly. So, let’s get into some of the details as to what makes this mower one of the best in the current market. One thing I don’t like about most high-end mowers is that to function at their absolute best, these machines need year-round maintenance and oil chute cleaning. However, keeping this exact issue in mind, Ferris provides their IS700Z with a Kawasaki engine which offers a 500-hour oil change interval along with an Oil Guard System. This significantly diminishes the need to go for periodic maintenance checks and will help you save a lot of money in the long run. The Ferris IS700Z comes with a convenient foot-operated deck lift feature that helps me to effortlessly change the cutting height from 1.5 to 5 inches in 1/4 inch increments. So customizing the lawn whichever way you prefer will not be an issue with this mower. The floor pans are also easily removable and provide convenient access to the top of the deck for better cleaning and service. This also cuts down on a lot of the maintenance charges and will help you improve the mower’s durability in the long run. I found the deck controls to be exceptionally smooth as well. They’re designed with pillow block bearings on each of their mounts. This grants them much of their precision and helps the controls to last longer even after hours of use. 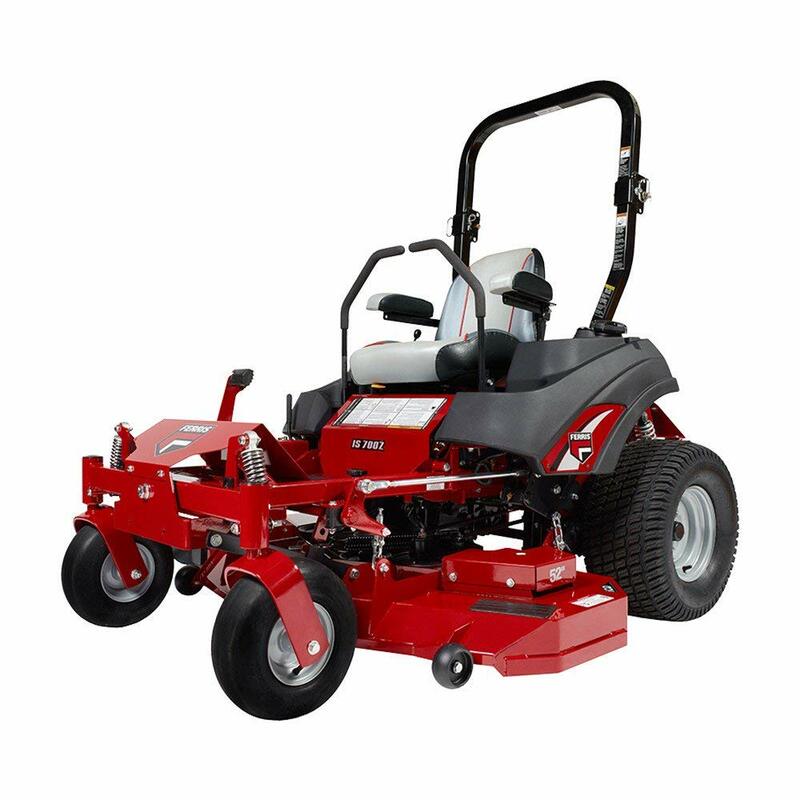 The adjustable rear coil-over shocks make the ride incredibly smooth, and along with the front independent adjustable coil-over-shocks, I don’t feel much vibrations even when the mower is going over rough and uneven terrain. As I’ve mentioned before, the ICD cutting system is perhaps one of the most important design aspects of the Ferris IS700Z mower. 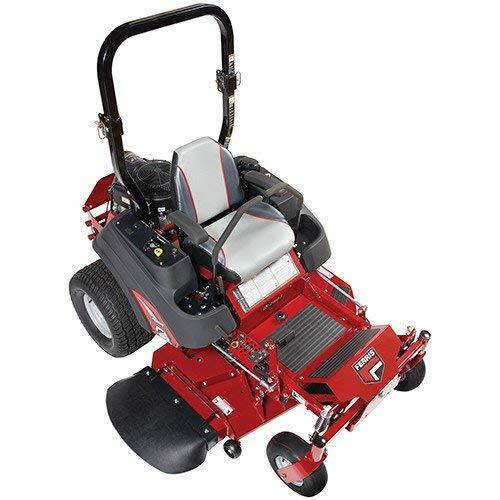 It maximizes the cutting accuracy of the mower and along with the big 61 inches deck, it indeed makes this model one of the fastest grass trimming machines in the market. It can go through the largest of lawns in a matter of hours and every time I used it, I was able to complete my trimming well ahead of schedule. In my opinion, trying to avoid scalping in wide ditches with this mower was incredibly difficult to achieve. Some of my taller friends, especially those who are are around 6 feet in height or more have a lot of trouble using the deck raising pedal. They find it to be far too close to their body and somewhat inconvenient. What is the gauge of the ICD technology that is present in the mower? The gauge of the ICD that comes with the Ferris IS700Z is double 10, which is quite standard across all the ICD based engines. Will the mower leave behind any tire tracks on the lawn ground? With a 61 inches deck, it’s true that the Ferris IS700Z is more on the heavier side, but it’ll not leave any tire tracks or ruts behind unless the ground is exceptionally soggy. The Ferris IS700Z lawn mower is simply one of the very best when it comes to comfort, precision, and versatility. It has a wide range of fantastic features that I believe will perfectly suit any form of domestic and professional grass trimming needs. I hope you enjoyed my review today.